These courses are designed for low intermediate and intermediate non-native speakers of English. This course provides intensive instruction in listening comprehension, sentence and paragraph writing, and basic grammar. Students may enroll in ESL 076 F and ESL 078 F concurrently. This course is for high intermediate students of English. It provides instruction in critical reading, expository paragraph writing, grammar and vocabulary. It offers continuing practice in listening and speaking. This course is for low-advanced students of English. It provides instruction in academic reading, short essay writing, critical thinking, and advanced grammatical concepts. This course is for advanced students of English. It provides instruction in academic reading, critical thinking, and expository essay writing with some review of advanced grammar. This course fulfills the reading requirement for graduation. This course is for advanced students of English. It provides instruction in college-level reading and essay writing, critical thinking, basic research skills, with some review of advanced grammar. This course fulfills the prerequisite for ENGL 100 F.
This course is for advanced students of English who are non-native speakers. It provides instruction in college level reading, essay writing, basic research skills and review of English grammar and editing. This course fulfills the prerequisite for ENGL 100 F or ENGL 100HF. 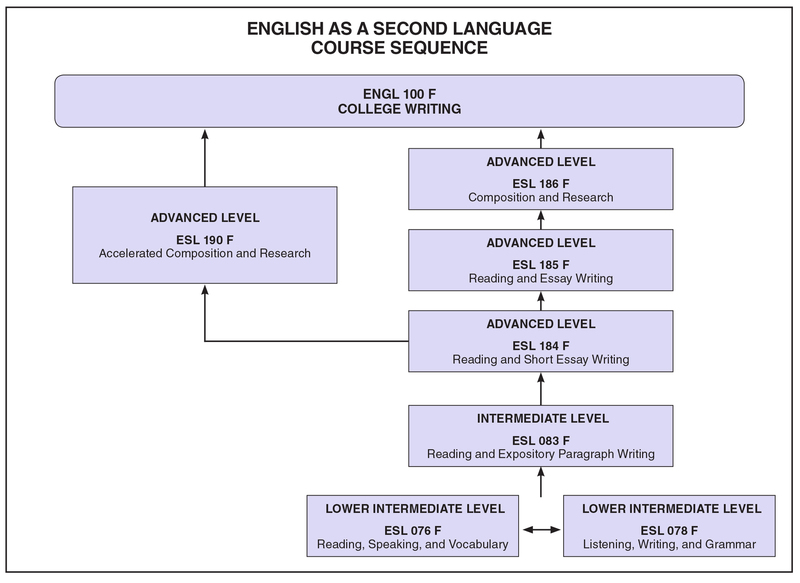 ESL Core Courses provide instruction in academic reading, writing, and critical thinking. In addition, each course is supported by vocabulary and grammar concepts relevant to each level. 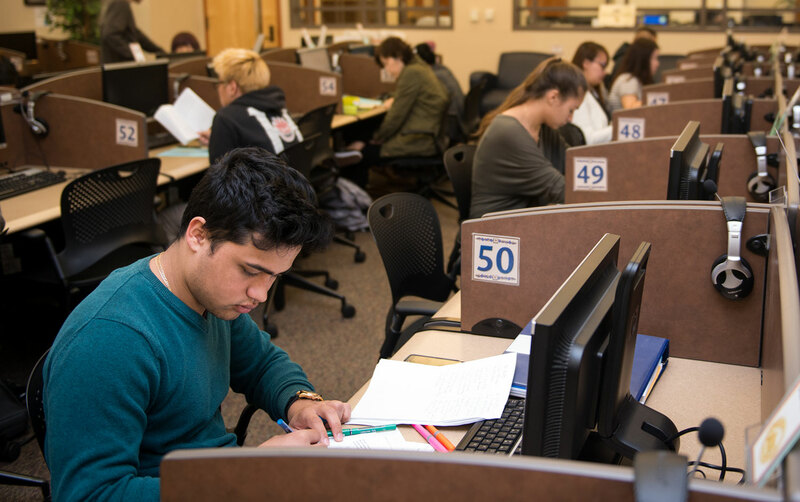 After applying to Fullerton College, you must take the ESL Assessment Test and meet with a college counselor to help identify the appropriate ESL core course level for your placement. ESL Support Courses are designed to provide focused instruction in specific aspects of English language learning such as conversation, grammar, pronunciation, reading, and vocabulary. This course will help beginning English speakers understand and participate in conversations in English. The focus will be on review and practice of common conversational and academic situations on a basic level. Recommended for students in ESL 76 F, ESL 78 F, and ESL 83 F.
Designed for students at an intermediate level, this course will improve conversational speaking and listening skills on a variety of everyday topics. Suitable for students with an intermediate skill level. Recommended for students in ESL 83 F and ESL 184 F.
This course is designed to practice and improve conversation, class discussion, and presentation skills for advanced ESL students. Topics will focus on current events and issues common to the academic setting. Recommended for students in ESL 185 F, ESL 186 F, and ESL 190 F.
This course is designed for beginning ESL students who need a basic introduction to English grammar and is designed to increase students’ knowledge and usage of verb tenses, sentence structure, and other basic grammatical topics. It will develop grammatical accuracy in listening, speaking, reading and writing. Recommended for students in ESL 76 F, ESL 78 F, and ESL 83 F.
This course is designed for intermediate ESL students who need to strengthen their grammatical skills in reading and writing. Recommended for students in ESL 83 F and ESL 184 F.
This course is designed for advanced ESL students who need to refine their grammar in written communication. Recommended for students in ESL 185 F, ESL 186 F, and ESL 190 F.
This course is for ESL students at a beginning level of oral expression and pronunciation. It provides instruction in developing basic pronunciation. Recommended for students in ESL 76 F, ESL 78 F, and ESL 83 F.
This course is for ESL students at an intermediate level of oral expression and pronunciation. It provides instruction in developing language fluency and style. Recommended for students in ESL 83 F and ESL 184 F.
This course is for ESL students at an advanced level of oral expression and pronunciation. It provides instruction in refining pronunciation skills in order to reduce foreign accent. Recommended for students in ESL 185 F, ESL 186 F, and ESL 190 F.
This course prepares non-native speakers of English for college-level courses by focusing on academic reading in content areas, critical thinking and analysis, vocabulary development, and comprehension skills. Recommended for students in ESL 185 F, ESL 186 F, and ESL 190 F.
This course provides instruction in idiomatic expressions and slang for high beginning to intermediate ESL students. Recommended for students in ESL 76 F, ESL 78 F, and ESL 83 F.
This course will present principles and techniques of vocabulary expansion for high beginning to intermediate ESL students. Recommended for students in ESL 83 F and ESL 184 F.
This course is designed for advanced ESL students who wish to expand their academic vocabulary in preparation for transfer to a university. Recommended for students in ESL 185 F, ESL 186 F, and ESL 190 F.
The ESL Lab at the Fullerton College Skills Center (Room 801) provides materials to help ESL students develop English skills and strategies in listening, speaking, reading, writing, grammar, pronunciation, and vocabulary.